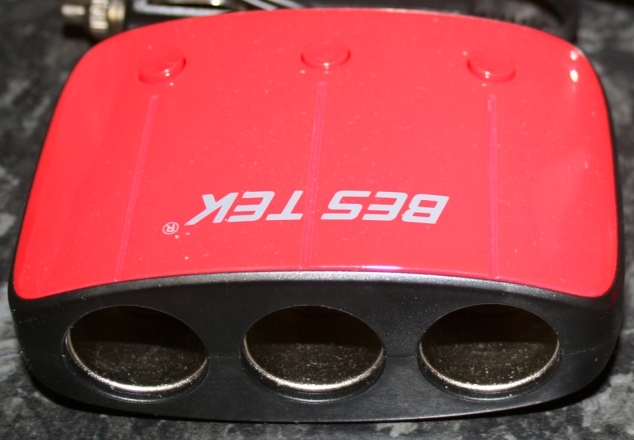 The car lighter socket splitter from bestek (or bes tek depending on where you read about them) is ideal for anyone wanting to power more than one device from their single car 12v or 24v power socket. In our case, we have a dash cam, a mobile phone and on occasion a battery charger for a vapestick. So fairly busy sometimes. The three main power outlets on the device are of the standard cigarette lighter jack type, and there is also a single standard 5v USB port on EACH side, which will no doubt come in handy at some point in the future but these are not currently in use. The splitter feels solid and weighty and there are a couple of things I would like to point out which makes this particular splitter / junction box ideal for the task in hand. On the top of the splitter you can see there are 3 switches – one for each port on the output. 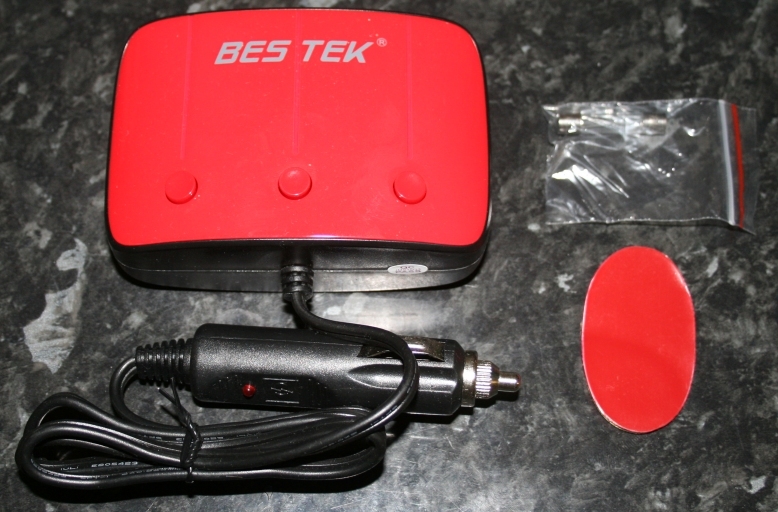 This is extremely handy for some devices you may want to use – such as a dash cam – because if your lighter socket is permanently live (even when the car ignition is switched off) – then you can easily choose to run the recorder in parking mode or switch it off without the hassle of having to physically remove the jack plug (either from the car socket or the splitter) every time you stop driving. Another example of how useful these switched types of boxes are would be where you want to leave a charging cable plugged in to it, but do not like the idea of having the business end of the cable hanging around potentially making short circuits across its pins due to all that rubbish lying around between the driver and passenger seats! Simply leave the cable plugged in but power down the port using the associated switch. It doesn’t appear to have a switch though for the USB ports, no biggie, but there isn’t one – both ports on the gang remain live as long as the device is connected to a live port in the vehicle. Each of the USB ports has its own electrical rating – which is a bit of a deviation from the actual definition of a USB port to me. Remember that USB stands for “Universal Serial Bus” – assigning different ratings to the ports by setting one of them a 1A and one at 2.1A max current creates two different ports – now looking back I wouldn’t know what the maximum draw on a PC standard USB port is in truth – but you have to be aware that its not going to do any good putting a 2A device on the 1A port – so be careful which one you choose to power your device with. Always be cautious – and think about the fact that the simple shape of an end connector or the size of a port does NOT define its output limitations or viability for use with a given electrical accessory. Looking from the front, there is plenty of space between the holes to allow for the connection of slightly wider jack plugs if you have any. I want to draw your attention to the jack plug which is attached to the actual splitter – the reason for doing this is because a lot of the Chinese junk we see coming into the country is made from low grade cheap plastic – and jack plugs seem to be no exception. The photograph below shows how Bestek have provided a solid metal tipped plug instead of one of those poor quality plastic ones – where the danger is that over time they become weak and the end can often break away. When it does finally snap off, invariably the parts end up stuck in the car socket and can be fiddly to get out. This one is metal so hopefully it shouldn’t have this inherent weakness. The end of the plug unscrews to reveal the fuse housing for easy replacement should it blow (a spare is included which shows care and attention to detail by the manufacturer). See below. One other little enhancement to the overall package is the inclusion of a sticky pad which can be attached to the base of the splitter and in turn stuck to the car dashboard enabling the owner to keep the box safe and tidy out of the way and in a position which is ideal for allowing access to the ports, rather than having the box “drifting” around the car between and underneath seats etc. 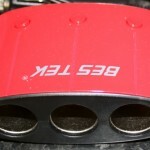 When fitting one of these, be aware that you are only getting an extra two ports given that connecting this takes up your existing car port (these are in addition however to the two USB slots so four in total if you count those). Overall – I love it.